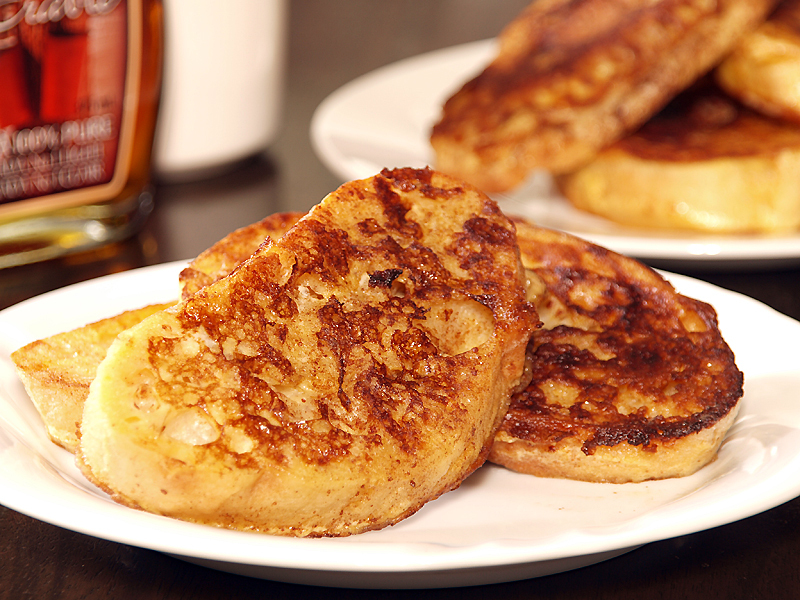 French Toast is a type of dish where pan fried bread rolled in a mixture of milk and eggs. A very old recipe which dates back to the Medieval period where old stale bread is revived by moistening it and reheating, people living those times need to use every bit of food before to feed their families specially during tough times. It just not saves the old bread it even adds additional nutrients by adding eggs for protein sustenance but this does not mean that the poor people only prepare this kind of dish even the wealthy enjoyed it as cookbooks during that time already had featured this but only the finest breads are used with their crusts off. I love this as a breakfast specially when served with honey or maple syrup, indeed it is a good way of reusing stale bread, how about you what are the other ways you use stale ingredients? Mix together cream, honey, salt and beaten eggs in a shallow bowl. Prepare a non-stick pan, add a small amount of butter and place it in low heat. Quickly soak each bread in the egg mixture, sprinkle cinnamon powder on top then place it on the pan, brown each side. Do it with the remaining bread then serve with maple syrup. Love French toast but we usually enjoy ours more savoury with bacon on the side and I only use beaten eggs with salt and pepper for the bread. I must try the cream version. I usually use milk for french toast but using cream is actually a nice idea. I know it’s higher calorie but once in a while is okay since we don’t eat french toasts often. 😉 Looks yum! Very simple and nice Raymund, gonna try with some old bread sitting in my fridge. You’re making my mouth water this week…first with the sushi, now with the French toast. I had a version of French toast at a breakfast restaurant in the city yesterday – it had lime zest and was served with a cherry relish. Mmmmm. One of our favorite brunches. Those look great. I love this but sadly almost never make it due to the high calories..
…my favourite way of serving it is to douse the top in ground cinnamon and sugar (yeah, really healthy …NOT). Stale stuff? ok, right now I can only think of bread… which I throw into the food processor along with fresh herbs (usually parsley) and them I add the herb-y crumbs to grated cheese and sprinkle on top of pasta or potato oven dishes. When I used to be on an ultra tight budget years ago I’d save all my (washed) veggie peelings, onion skins and trimmings etc, freeze them, and when I had enough to fill my crock pot, i’d add water, any herbs I had to hand and black pepper corns (NO salt) and let it cook all night. In the morning I’d have fresh salt-free vegetable stock ready to strain and freeze and NO wasted veggies to make it!. Almost any culture has a few tricks for reviving and rescuing stale bread (croutons, crumb toppings, meat mixture fillers, bread salads, bread in soups . . .). Soup, of course, is the great catch-all for vegetables that are a little too old now for fresh eating, meat that is too tough for a fillet or roast, cheese rinds, leftovers from the casserole, and more. But I can’t think of many clever-rescue foods that have risen to such a state of veneration and even ended up being thought of as such a Treat as *pain perdu*! I never knew the history of french toast, but it makes sense! Kind of like using stale bread for bread pudding… it looks delicious!! I love French Toast! I just had one a couple of days ago at Imperial Palace. I use milk instead of cream. Love the way you take pictures of your food. So good, I love that you used thick slices to really give it that extra something. I’d never thought to use cream before, it must make it delicious! don’t you get sick from eating stale foods? i don’t think i’ve had french toast before. this looks easy but grand.. Bread and butter pudding or making breadcrumbs 🙂 Your photo makes me want to grab it and take one crunchy bite !